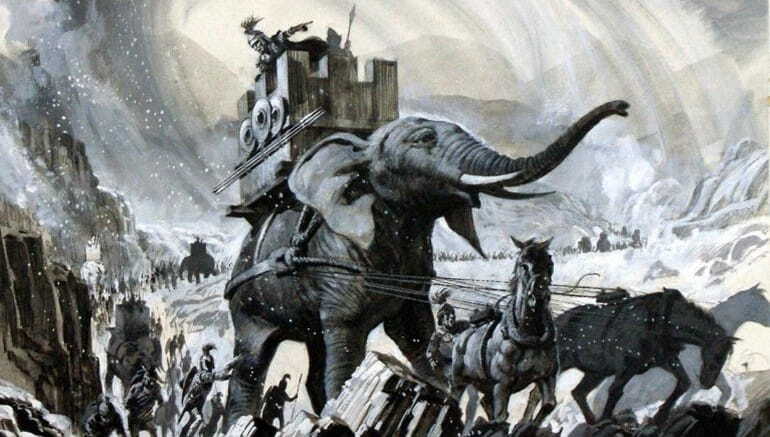 Hannibal and his army’s crossing of the Alps in 218 BC is often viewed as a military action that is tantamount to daredevilry on a large scale – a feat that is akin to the stuff of legend. The sheer scale of this audacious operation translates to a vast army of 30,000 troops, 9,000 horses (and additional pack-mules), and 37 war elephants that crossed the mighty yet treacherous Alps in just 9 to 16 days. However, beyond the extraordinary scale of this overland invasion force (that traversed 80,000 sq miles of a mountainous region), there has always been a debate in the academic circles concerning the actual geographical point through which Hannibal made his ambitious military foray into Italy. Well, to that end, PBS’ new documentary – Secrets of the Dead: Hannibal in the Alps (that aired on 10th April) might just have a few answers. Now the popular notion concerning the route that was crossed by Hannibal and his army pertains to the Col du Clapier, also known as the Way of Hercules in the ancient times. However, the researchers have hypothesized that the Carthaginian general opted for an even more dangerous path known as the Col de Traversette, which is situated at a higher altitude. At the same, the pass with its steeper climb made for a faster route through the mountains – thus suggesting how Hannibal possibly took the gamble. Using a combination of microbial metagenome analysis, environmental chemistry, geomorphic and pedological investigation, pollen analyses and various other geophysical techniques, the researchers have shown that a ‘mass animal deposition’ event occurred near the Col de Traversette – that can be directly dated to approximately 2168 cal yr BP, i.e. 218 BC. In other words, the analysis reverts to the ‘elephant in the room’, pertaining to the literal elephants in Hannibal’s army and their excretory remains. Added to that scope, we are also talking about thousands of horses and pack-mules – and how their incredible numbers might have resulted in what the scientists have termed as ‘mass animal deposition’. Now as the researchers excavated the dirt in the area, they analyzed how the surface soil with its peaty nature fused with plant fibers, gradually gave way to a more compact variety of soil that was mixed with a fine-grained variety. This suggests that the deeper layers of soil (at 40 cm depth) were agitated by some above ground-based pressure of a substantial scale, like the passing of throngs of animals through the zone. Consequently, the experts radiocarbon-dated these soil specimens, and to their pleasant surprise, the ‘dirt’ was dated from 218 BC – the very year in which Hannibal and his army crossed the Alps. 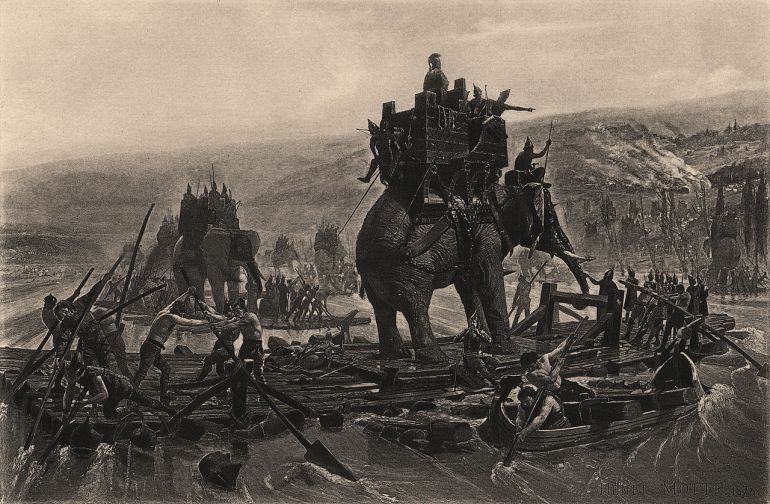 Hannibal’s elephants crossing the Rhone in makeshift rafts. The Col de Traversette pass in itself is around 2,600 m (around 8,530 ft) above the sea-level, and as such boasted rich soil that could have at least fractionally supported the flora needed by the grazing requirements of the animals like elephants, horses, and pack mules. So from the strategic perspective, it does makes some sense that Hannibal and his presumably huge baggage train might have halted temporarily and then passed through the zone. On the other hand, the unexpected route, with its dangerous twists and turns, sort of also reflected the daringness of Hannibal himself, thus alluding to the Carthaginian leader’s proclivity for taking up challenges and gaining the ‘element of surprise’ over his foes. Talking about grazing requirements and logistics, it should also be noted how elephants require over 200 pounds of food per day for general sustenance, and this number could go up when the animal is going through strenuous exercise (like crossing the ‘supernatural’ Alps). In essence, a considerable amount of food also had to be carried by the army’s baggage train, which must have consisted of thousands of pack-mules. 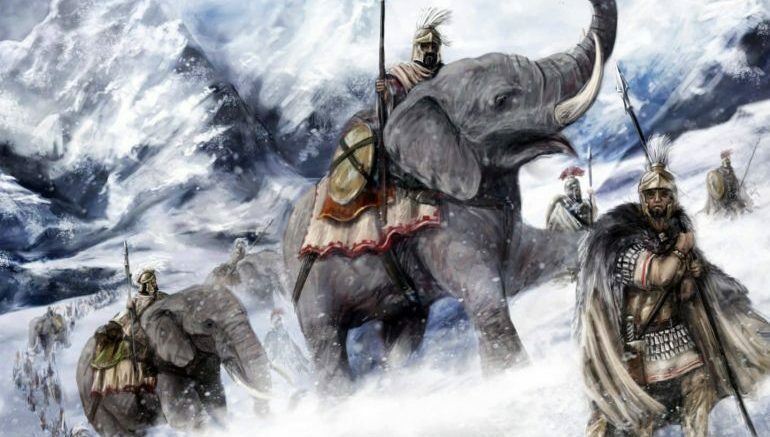 Furthermore, many of these animals were lost after Hannibal’s army encountered a variety of obstacles while crossing the dangerous pass, ranging from landslides, blockages to even ambush on the part of local tribes. All of these factors raise the question – why was the Carthaginian army, comprising around 40,000 men, willing to put up with the ‘whims’ of their leader? Well, when it comes to history, Alexander was known for his self-assurance, Hannibal for his personality. Livy attests to the latter’s leadership skills by mentioning how Hannibal managed to not only control his mercenary army (which had been described as ‘a hotch-potch of the riff-raff of all nationalities’) but went on to win victories over the Roman forces for fifteen straight years – and that too within the confines of ‘foreign’ Italy. The irony in this case related to how the same folks who fought for money and plunder, grouped together to forego such things in favor of innumerable hardships for their chosen leader. This certainly speaks highly of the potent charisma demonstrated by Hannibal all throughout these rigorous years spent in a foreign land. However, beyond just charisma, there must have been a more intrinsic sensitive side to his ‘management skills’. Literary evidence points out how Hannibal slept alongside the ordinary soldiers out in the cold open; he even went hungry along with his soldiers when the supplies ran low. But more importantly, the soldiers (despite their different origins) placed their utmost trust on their Carthaginian commander when it came to actual battles. Simply put, they acknowledged and followed the directives of their general – mostly without question, due to their collective belief in the prodigious generalship of Hannibal. And lastly, while the feat of Hannibal crossing the Alps was certainly audacious, the ‘audacity’ of the scope was fairly well planned by Hannibal. Simply put, the crossing was not just tried and accomplished purely for the ‘shock and awe’ factor that would psychologically afflict the Romans. There was a deep strategic side to the entire affair, and the Carthaginian general precisely weighed his option and then decided to go for the calculated risk. Obviously, this entailed years of planning, with the original scheme of crossing the Alps sometimes even attributed to Hannibal’s brother-in-law Hasdrubal the Fair (or possibly his father Hamilcar) – who commanded the Carthaginian forces in Spain from 229 BC. And if the latter case is true, then the Romans themselves might have known about this grandiose plan, and perhaps were even relieved when Hasdrubal was assassinated by a Celtic mercenary in 221 BC. Conducted his enterprise with consummate judgement; for he had accurately ascertained the excellent nature of the country in which he was to arrive, and the hostile disposition of its inhabitants towards the Romans; and he had for guides and conductors through the difficult passes which lay in the way of natives of the country, men who were to partake of the same hopes with himself. Secrets of the Dead: Hannibal in the Alps (link here) was originally aired on 10th April 2018. For more info, you can take a gander at this press release.